Dickey’s Barbecue Pit: The Musical is the satirical, unauthorized response to the Dickey’s Barbecue Pit franchise success story. It features Chris Kelley, the Dancing Dean of Dickey’s Barbecue University. Just in time for Oscar season! Please watch, hare, repost and add your review below. (UnhappyFranchisee.Com) DBRI, the Dallas-based franchisor of Dickey’s Barbecue Pit, sells families and individuals the dream of joining their “franchise family” and investing their futures into a Dickey’s Barbecue Pit franchise. They portray themselves as having a passion for barbecue, a technologically advanced restaurant system, and a support team that really, really cares about franchisee success. Dickey’s Barbecue Pit: The Movie is our response to DBRI’s aggressively promoted Dickey’s Barbecue Pit success story… told using the sweet dance moves shown in the training videos Dickey’s publicly posts daily on YouTube. Dickey’s training videos have no copyright verbiage or confidentiality warning… in fact they include links to social media with a gracious invitation to share. Neither UnhappyFranchisee.Com nor this video are affiliated with DBRI or Dickey’s. 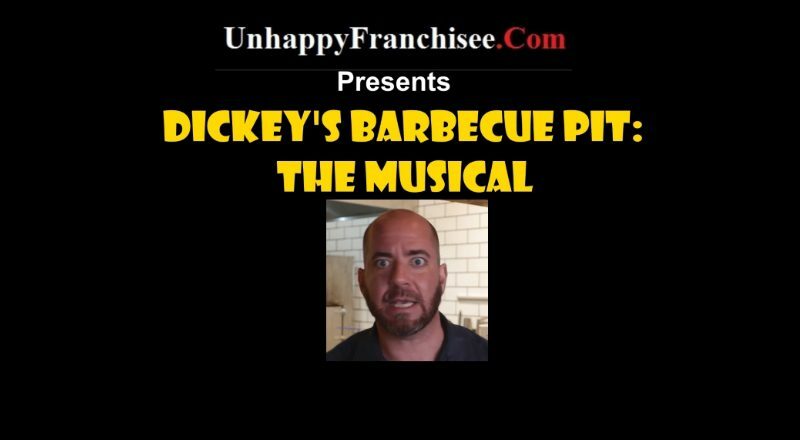 Dickey’s Barbecue Pit: The Musical is a satire, a parody, and the expression of the opinion of UnhappyFranchisee.Com alone. Don’t take our word for anything – do your own research and let us know your opinion. Statements of fact are the result of our research posted here, including the Dickey’s Barbecue Pit Closed Location List project and Dickey’s Franchise Graveyard. We invite DBRI or anyone else to provide any corrections or clarifications so that we can correct, if necessary. You may also verify our factual claims through the Dickey’s Franchise Disclosure Documents and Dickey’s Barbecue Pit Franchise Lawsuits pages. Whether to invest in a Dickey’s Barbecue Pit franchise is a personal and family decision. However, the Federal Trade Commission (FTC) enacted The Franchise Rule so that prospective franchise owners would have access to information necessary for making an informed decisions. The FTC intended for franchisees to have access to the experiences and candid opinions of both current and former franchisees; that is why Dickey’s is required to provide contact information for them. In our opinion, Dickey’s management, its in-house legal department and its highly paid franchisor attorneys have effectively deprived prospective Dickey’s franchise owners from hearing the experiences and opinions of current and former franchise owners – especially those who have failed. Dickey’s franchise owners and employees, past and present, have expressed their fears of retaliation and litigation if they share their opinions with the media or prospective franchise owners. Consider a contribution to our informational campaign here: Support UnhappyFranchisee.Com. Support your local Dickey’s franchise. The food is good… and they need all the help they can get! WHAT DO YOU THINK OF “DICKEY’S BARBECUE PIT: THE MUSICAL?” IS IT AN EFFECTIVE WAY TO EDUCATE THE PUBLIC ON THE DICKEY’S BARBECUE PIT FRANCHISE? SHARE A COMMENT BELOW. ← Is U-Save Auto Rental CEO Tom McDonnell Guilty of Bankruptcy Fraud? I don’t know how I feel about the choice in music, but ok. I was saving the Texas swing tunes for Roland Jr.’s debut. would that be the 2 step hustle? The song and dance Dickeys does for new owners is horrible. It’s only a matter of months before you do a song and dance of your own trying to balance all the bills and employees with a business model that even Travis Dickey said would fail. I personally think Chris will appreciate this. Ha, Chris would probably be flattered. Disgusting!!! Kinda sad and very, very close to the truth about Dickey’s. Churning, scamming, misappropriation of marketing fund (Fund were used frequently for Tech in the Box and other non marketing activities. The Marketing Fund is internally called “Slush Fund”. ), and many, many more. Also, what was not enough outlined in the video, is the fact that franchisee and franchiser relationship is handled on threat basis all along the line from when you sign agreements until you go eventually bankrupt. I know from my own experience that I got threatened a couple of time after signing the FA. I would have immediately terminated the agreement but had already paid down a very substantial amount and couldn’t afford to terminate and not get back the money. Afterwards, I think, I should have terminated the agreement as soon as the threats began. Would have saved me a lot of headache and money. But this is the fact after the child fell into the well. I think this is a great way to educate the public. It should be on every TV news broadcast nationwide! I wish this type of information was out there when I was doing due diligence on Dickeys. Their deceit and fraud have financially destroyed families nation wide. The whole damn family belongs in jail, and when it happens….cocktail glasses will be raised across the nation in celebration! Anyone considering going into business with the family must RUN! And they just had another round of layoffs. Yes, and in 4 years have had 5 franchise directors, most without any notification. Dickeys barbecue is a scam. You have warned not to do business with them. The truth of the matter is most of the franchises I meet when we purchased our franchise should not have been approved. We walked into DICKEYS with the greatest of interest and told them what we could comfortably afford to invest ” approximately 150k ” and were told that is was absolutely doable, 6 months later after construction issues ” thier referred General Contractor steals our 75k downpayment and major construction issues” we where 350k in debt !! Then after 18 months struggling to keep the doors open they approved another franchise 5 miles down the road from my location and just killed our business. So now we are bankrupt, broke, depressed and not only lost all our material possession we lost our GOOD NAME in our community, our church, and even our family. DICKEYS doesn’t just take all your money and bleed you dry they take your respect !!! !